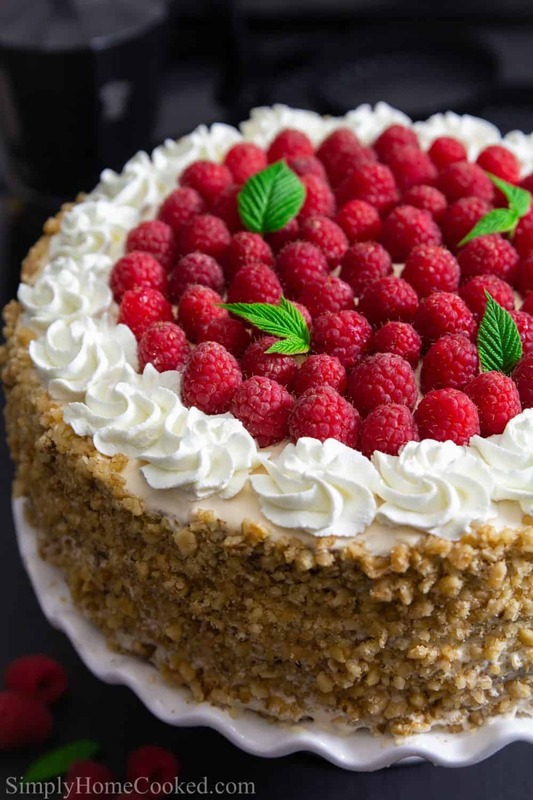 This Honey Raspberry Cake is made with fluffy layers of honey cake smothered between a sweet dulce de leche cream, fresh raspberries, and coated in chopped walnuts. You will also love this delicious and beautiful Berry Chantilly Cake. Such a gorgeous and delicious cake recipe to add to your summer menu plan! This recipe was originally posted March 21, 2015, we’ve tweaked it a bit since then. This post may contain affiliate links. Read my disclosure policy here. There are so many different cakes out there, the flavor combinations are endless. In the past year, I’ve been trying to come up with new cake recipes for the blog, so I’ve had had my fair share of cakes. Some were delicious at first but after a few bites, I’d feel kind of sick. Some cakes are just too heavy and sweet for me to enjoy. This cake is very different. It has a subtle hint of honey in the batter and a nice tartness from the fresh raspberries in each layer. The cream is still pretty sweet, but the raspberries do a great job of balancing it all out. It’s such a light, yet a satisfying cake, it’s hard to stop eating it. 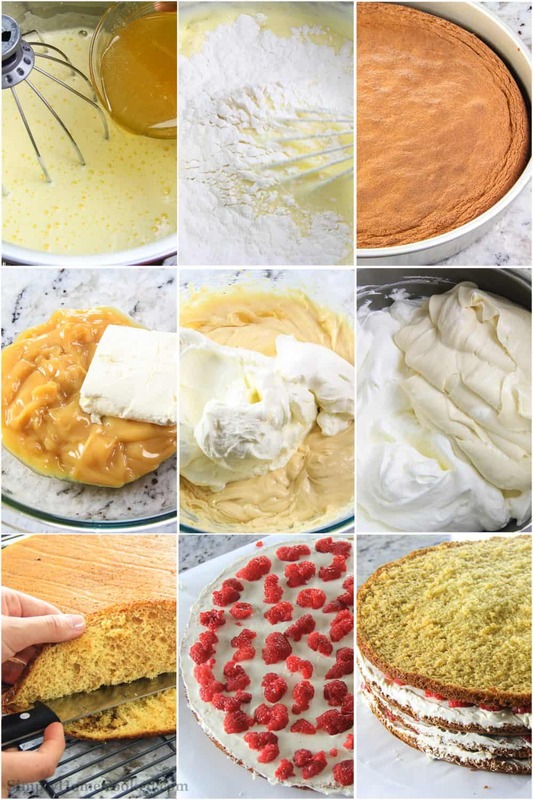 Note: Originally this cake recipe was baked in a 12-inch pan as seen in the photos below. I have updated the recipe to fit a 10-inch cake instead. A 10-inch cake seemed to be the preferred cake size by most of my readers, therefore the cake layers will be a little thicker than pictured in step 14. Begin by printing the recipe below and going over the ingredients list and directions. You will start by following the directions to make the sponge cake. Once it has cooked, you will allow it to cool. While the cake is cooling, you will begin making the cream layer to go between the layers of cake. Follow the directions carefully to make sure you don’t overwhip any of the ingredients. Once the cake has cooled properly, you will slice each in half to create four layers. Follow the directions for layering the cake, cream, and raspberries until completed. 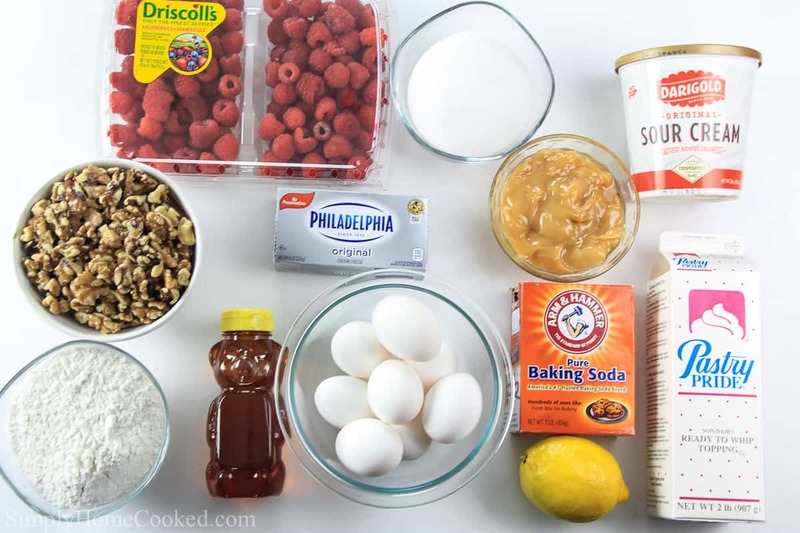 You will finish by adding chopped walnuts to the outside of the cake, and fresh raspberries on top. You can add extra raspberries and fresh mint to the top to add extra flavor and to make the cake look more beautiful. Baking a cake is one of those amazing culinary arts that seems overwhelming, but is truly easier than you can imagine. I love this raspberry cake, even though it does take some time to prepare. Once you’ve learned the in’s and out’s of preparing a cake, you will find future recipes easier to manage. Line 2 (10 inch) baking pans with parchment paper. Spay a generous amount of nonstick spray on the bottom and sides of each pan. In a stand mixer, lightly beat eggs just until bubbles form. Slowly add in the sugar and beat on high speed for about 10-12 minutes or until the mixture becomes thick and airy. Warm the honey in the microwave for about 15 seconds and slowly add it to the batter while the mixer is on medium speed. As you add in the baking soda, squeeze the lemon juice on top so that all of the baking soda becomes fizzy. Using a large whisk fold in the sifted flour. You don't want to mix vigorously. Folding the batter slowly will help retain its air consistency. Once the flour is folded in well, pour the batter into to 2 (10 inch) round cake pans. Preheat the oven to 350 degrees Fahrenheit and bake for 10 minutes. Drop the temperature to 340 degrees and bake for another 10 minutes. A good way to know if the cake is done, is by piercing the center with a toothpick... If the toothpick comes out clean, it's done baking. The cake will seem a bit dark compared to most cakes, that's because of the honey in the batter. Once the cake is done, remove it from the oven and let it cool for a few minutes. Transfer the cake to a cooling rack and let it cool down completely. Using a handheld mixer, combine the softened cream cheese and boiled condensed milk. I always have boiled condensed milk at home. If you don't, you can make your own by submerging a can of condensed milk in water, and boiling it for 2-3 hours. Make sure it's completed cooled before using. carefully add the sour cream to the cream cheese mixture and set aside. Use a spatula to fold the sour cream in. Over beating it will make it runny. If you're using pastry pride, beat it with the whisk attachment on high speed until stiff peaks form. If you don't have pastry pride, beat cold (high fat) heavy whipping cream, 3 tbsp sugar, and 1 tsp vanilla on high speed until stiff peaks form. Gently fold the cream cheese mixture to the pastry pride (or whipped heavy cream mixture) until well incorporated. Do not over beat, over beating will make the cream runny. Slice each cake in half so you end up with 4 layers. Lay 4 pieces or parchment paper onto the dish you plan to serve the cake on. That way, when you're done decorating the cake, you just pull out each piece one by one and your serving dish is nice and clean. 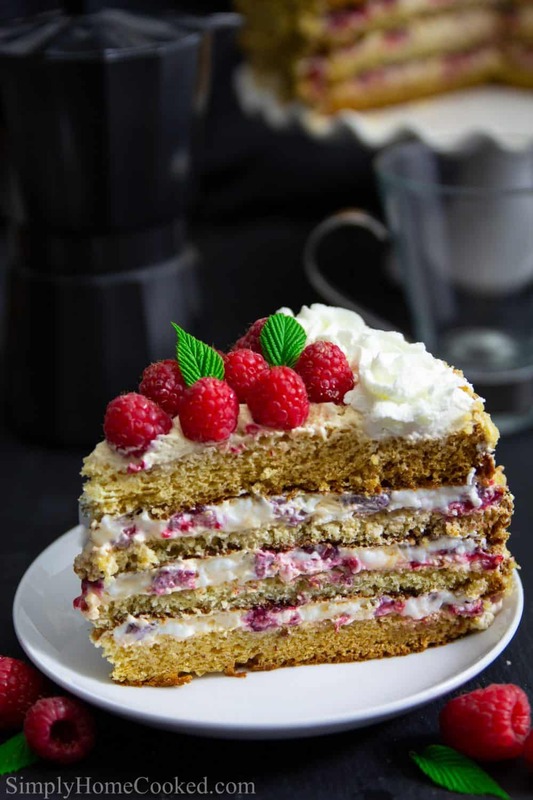 Spread a generous amount of the cream onto the first layer of cake then add an even layer of raspberries on top. Add the next cake layer and repeat step 15. You should end up with 3 layers of raspberries and cream. Place the 4th cake layer on top and spread the rest of the cream on the top and sides of the cake. Chop the walnuts and sprinkle them over the entire cake. You can leave the cake as is, or you can decorate it however you want. * The most accurate way to measure flour is to scoop it into a measuring cup using a spoon. Then scrape off the excess flour with the edge of a knife. Hello Dina, I have to give this cake 10 stars!! I made it this afternoon & we had it with family this eve. It was perfect ♥️ Thank you so much for the recipe! Everybody loved it!! Loved the cake the first time I made this!! But I want to make the cake layers ahead of time and was wondering if I can store them on the counter top or do I have to put them in the fridge ? Hi Angie, I’m glad you like the cake 🙂 I usually make my cake layers a day in advance, wrap them in paper towels and plastic wrap and leave them on the counter. Hello.. I would say it’s such a pleasure… But kindly note , I prefer the 12 inches version more. The size and height is just good. I’ve saved a screenshot of the first version and I’m very about happy about it. Today, I baked a cake of 10 inches and it turned out perfect. Personally I like it when cakes are of medium height, they’re convenient to eat;). Thank you for your feedback Alla. I’m glad you enjoyed both versions.The 12 inch version is definitely nice for large parties. I was wondering could u adjust the recipe to me for a 9inch cake pan, cuz I want to make it small in size if that’s possible? Hi Tatyana, I’m not too sure how the cake will turn out if I adjust the recipe with out actually trying it myslef. I would reduce the recipe down by a quarter. So instead of 8 eggs, use 6. As followed, reduce all the other ingredients down one quarter. Again, I’m not too sure how it will turn out. I would like to give it a try next time I bake this cake. Where do you buy Pastry Pride cool whip at? Hi Valya, I buy it from a store called Cash & Carry. Thank you for the recipe. Made this cake for family and everyone loved it. It wasn’t too sweet- (which is what we like) and the raspberries were so perfect in this cake! Thanks again. A favorite for us now! Alla I’m so glad to hear you all enjoyed the cake! 🙂 Its also one of my favorite cakes because it inst too sweet. Hi there! 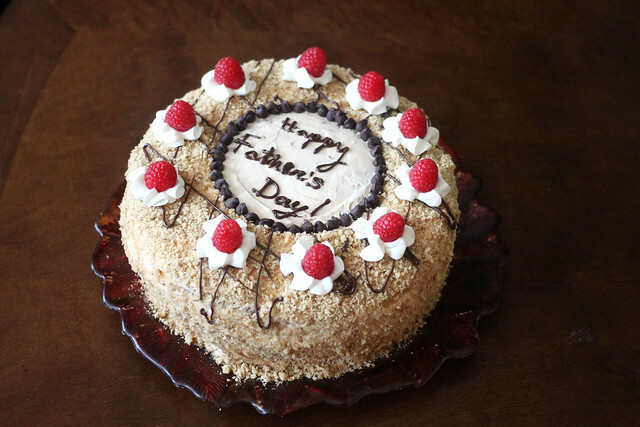 I made this cake today for hubby for Father’s Day and while we haven’t ate it yet, I can’t wait to try it tomorrow! The cream turned out soooo yummy 🙂 For the crumbs, I mixed walnuts with graham cracker crumbs and it turned out really good 🙂 Here’s a pic of mine, thanks for the recipe! The cake tastes amazing :))) thanks again! What hashtag should I use on Instagram? 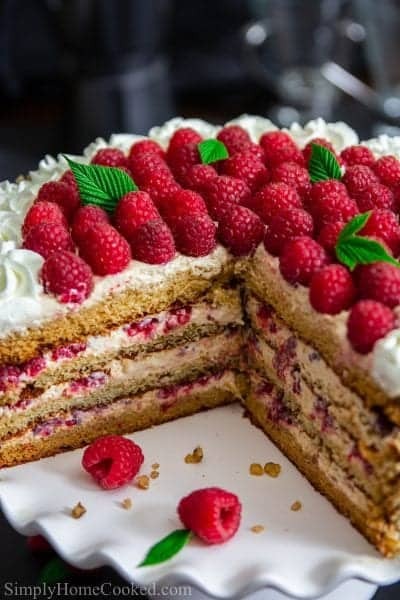 This layered raspberry cake looks incredible! You definitely can cut me a slice right now. I love the flavor combination in this cake, the condensed milk cream works so well with the honey layers! I can taste it in my mouth lol!